This wargame allows you to play The Siege Of Draman Del during the course of the adventure: "The Legend Of The Steel General". 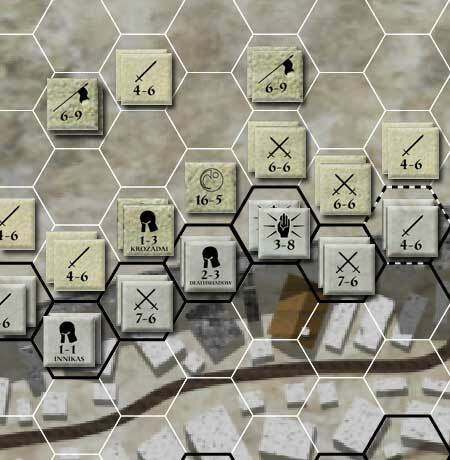 It can also be played as a stand-alone wargame. Draman Del is an ancient fortress city in a mountain pass, the only pass between the west and east lands. The west is represented by a confederation of kingdoms (Nath, Drakand, Draman, Randrom, Svariji, Land people) formerly known as "Draman". Draman Del is the only fortification against the east people, the barbarians called Zenith; if it should fall, the barbarians may swarm over the west kingdoms. The Seven Black Generals all host a shard of the soul of the evil god Zadrak and have been asleep for thousands of years but now, unknown to all, they are awakening. One of them, Xishayah, under the name of Kan Zenith, has gathered the nomadic Zenith tribes and is leading them to attack the west. To do this the legendary fortress of Draman Del must fall before General Adran arrives with reinforcements. 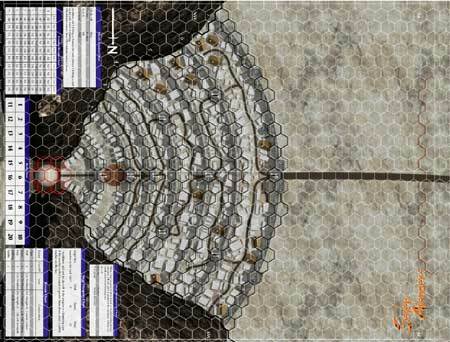 This beautiful map shows a top-down view of the Draman Del fortress. O'Bully built the entire city using a 3D modeling program and rendered it with textures and shades. On one side are placed some useful charts.The map is 22x17 inches. Note: you should cut the playing pieces, using glue to affix them onto a stiff surface (i.e. cardboard) and cut them using a modeling cutter. You can see some of the counters designed by O'Bully. All the units presented in The Legend Of The Steel General are present in this wargame. In the middle of the picture you can see Deathshadow fighting the feared Gwark. On the right side the Scarlet Rose Brotherhood and some elite infantry units. Innikas and infantry are placed on the left side, you can see also Krozadai, the Zenith chief. The first adventure in the Seven Avengers saga, The Legend o ..